The heat from a gas stove is not evenly distributed throughout a pot or pan. Gas flames spurt upward in a ring of flames. Because the flames are beneath the pot or pan, the cookware must redistribute the heat throughout the pan so the food contained inside is sufficiently cooked. 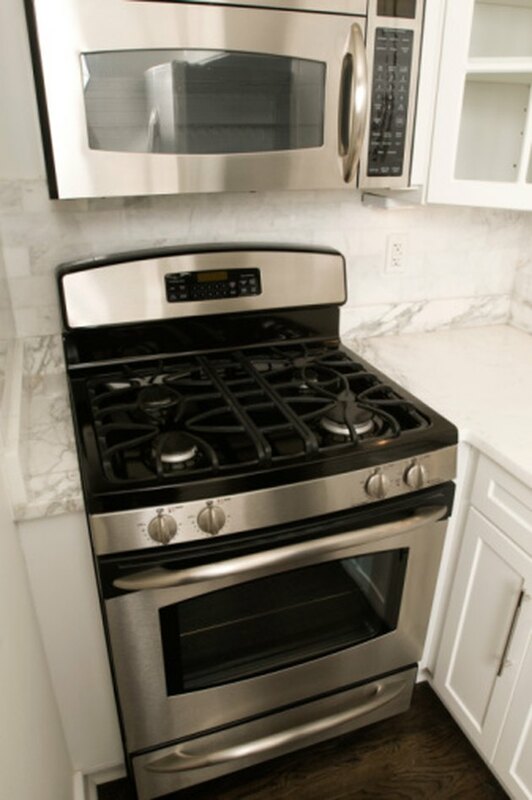 Adjusting the gas flames to match the size of the pan and the type of cookware used on a gas stove are ways to compensate for the uneven heat source. The Minnesota Blue Flame Gas Association maintains that cookware that conducts heat evenly should be used while cooking on gas stoves. Choose cookware that evenly conducts heat when cooking on gas stoves. Copper pans are very expensive cookware choices, but, according to Cooking for Engineers, when the pans are lined with nickel, tin or stainless steel, the pans are a good choice for all stoves. Use a copper pan about 2.5 millimeters thick for even heat conduction while cooking on a gas stove. Aluminum is a favorite choice in cookware utilized for all variations of stoves, including the uneven heat source from a gas stove. The Clemson University Cooperative Extension Service says that over half of cookware purchased by consumers is constructed of aluminum. Most aluminum cookware contains nonstick coatings that decrease the occurrence of scratches. Anodized aluminum undergoes a process resulting in a harder aluminum surface that cooks evenly and won't react to foods high in acidic content. Stainless steel pans are durable but tend to discolor when overheated. Dishwasher safe, stainless steel pans are easy to clean and as a result are a good choice for cookware. The Consumer Research website maintains stainless steel pots and pans conduct heat uniformly when used on a gas stove and within ovens in cooking temperatures not exceeding 500 degrees Fahrenheit. Stainless steel pans, regardless of the stovetop being used, requires the addition of fats, such as butter, oils or cooking spray, to avoid burnt food because the pan surface is not treated with any type of nonstick substance. Cast iron conducts heat slowly, requiring constant awareness on the part of the cook and a low gas flame. The Clemson University Cooperative Extension Service says that classic cast iron cookware conducts heat evenly, which is necessary while cooking on the uneven heat source of a gas stove. Cast iron is an inexpensive cookware choice because it requires more maintenance than most pans. Rub cooking oil into the interior of the pan with a paper towel or clean cloth to season the iron. Cooking for Engineers describes this seasoning of cast iron as essential to form a nonstick surface on the ordinarily porous properties of iron. Fats are melted and absorbed by the iron, and the iron cooks consistently.